The second edition of the Aicon Dealer Meeting was concluded on 6 July at Portorosa Marina in Sicily. The meeting with the partners of Aicon Yachts took place on two weekends (June 20-22 and July 4-6 2008) and saw the participation of dealers from all over the world accompanied by some boat owners as well. The dealer meeting was an occasion to give a preview of the new models, to discuss technical aspects and strengths, and to illustrate the new projects and the sales policy. The Dealer Meeting involved dealers from all over the world, from China to the Arab Emirates, from South Africa to United States and from Greece to England. Two weekends characterized by an intense program of appointments, presentations, round table discussions and events. The Dealer Meeting was organized with the objective both to strengthen the flow of communication between Aicon and its partners, and to analyze the opinions which emerged in order to improve service which the boat owners require. All the partners involved were given an absolute preview of the new models which will be launched in 2008- 2009. They were also given the opportunity to test the boats during the whole day dedicated to sea trials of the entire range. The series of appointments which followed in succession from morning to evening were concluded with a poolside dinner gala at the prestigious beach of the Hilton Hotel in Portorosa, also attended by Aicon Yachts President, Lino Siclari. The Dealer Meeting was also the first occasion to present a new project aimed at involving the dealers in company strategy, Dealer Management. The Dealer Management is an organization which meets regularly, made up of a representative of national and international dealers and company managers. The committee has the objective of building and sharing projects of a varied nature, which can range from the planning of new boats to sales, marketing and communications issues. Thanks to the founding of this body a real working network has been built which involves the dealers even more in the activities of the Group both on a planning and operational level. A 25,000 square meter Azimut Yachts shipyard characterized by high-tech and innovation, a basin of more than 20,000 m2, 40 tailor-made berths for large yachts of up to 60 meters from the exclusive range of Azimut-Benetti. And more: a 15,000 m2 Service Center which offers specialized refitting assistance, motor and hull repairs, crew training in the classroom, reservations for trips, flights and hotel stays. In sum, this is how the Marina of Viareggio of Azimut Benetti Group, the Italian company World leader in the luxury yacht sector, looked at the Yachting Gala 2008, which was held yesterday, Saturday June 28th. One year exactly from the first event held in Varazze, Azimut-Benetti selected the magnificent Marina di Viareggio for its most prestigious annual appointment with clients, dealers and the world of glamour, luxury and lifestyle. These worlds combine the allure and prestige of dream yachts with elegance, art and design. The more than 2000 guests who came from 54 countries and 5 continents were able to visit a fleet of 35 ships, 25 of which were available to be tried throughout the day along the coast surrounding the Marina. These yachts were made available by the Group’s three brands, respectively: Azimut Yachts, Benetti and Atlantis. This authentic “Private Boat show” has become an institution for everyone in the international yachting trade. It was the ideal setting to introduce to the world the new Azimut 70 and the Atlantis 50x4, two jewels of the sea that enrich the Group’s crown. Additionally, the simultaneous inauguration of Azimut Yachts’ new Showroom should also be highlighted. The showroom is the only one of its kind in Europe. It is a prestigious and sophisticated environment where yacht-owners will be able to choose the interior design of their yacht with the help of some highly qualified architects. The showroom will be enable yacht-owners to view the most exclusive and innovative designs aimed at customizing their life on board. This is a preview of the Luxury Showroom which will open in the near future as the feather in the cap of the group’s brand new Strategic Services Division, whose remit will range from financial activities to the managing of ports, marinas and yachts, on top of offering chartering options and global training for commanders and crews aimed at satisfying every single yacht-owners need. Paolo Casani, a manager boasting a 25-year experience in fashion and luxury goods at the highest level, having been a top manager at Armani, Valentino, Gruppo Finanziario Tessile, Calvin Klein and Ferragamo, has just been appointed head of the group’s Strategic Services Division. This appointment emphasizes the group’s position as premium style leader of its market sector. The gala evening ended with the soul music of Mario Biondi, one of the main musical revelations of the year. Kitonb, the dancing acrobats who mix circus art, theater and dance were entrusted with the spectacular unveiling of the two new models. Marcello Lippi, former coach of the 2006 World Soccer Championships winning Italian team was the Guest of Honor, a true man of Viareggio and a great admirer of the Group’s yachts. With her continuing success the Couach 3700 Fly has inevitably become the landmark of the Yacht Couture Couach collection. After the launching of the first model Kadimo in 2007 and her sister ship in March 2008, Couach shipyard launches Dragon its third exemplar that will be followed close behind by Parenthesis. Since the very successfully launching of the Couach 3700 Fly, seven models have already been sold in just one year. During July, Derek Carter, CEO and Alan Bowers, Commercial Director of luxury performance motor yacht manufacturer Fairline Boats attended a Reception at Buckingham Palace given by Her Majesty The Queen and His Royal Highness The Duke of Edinburgh. The Reception was for winners and recipients of The Queen's Award for Enterprise 2008 and follows Fairline Boats' receipt of an award in the International Trade category in April 2008. As per protocol, the Award will be formally conferred on Fairline at its premises in Northampton by Her Majesty's Lord Lieutenant, Lady Juliet Townsend, acting in her capacity as The Queen's local representative. This will be at a future date yet to be confirmed. A Queen's Award for Enterprise is the most prestigious corporate accolade that a UK business can win and honours outstanding UK companies. This is the second time in its history that the company has received a Queen's Award for Enterprise. Accomplishments considered by the judging panel when bestowing this prestigious award upon Fairline include doubling of their export sales over the last three years, increased overseas distribution and the creation of new jobs. In the prestigious setting of the Teatro alla Scala in Milan, Ferretti celebrated 40 years of challenges and love for the sea with all those who have contributed to the company's success. About 1.000 guests and personalities from across the world attended this private concert, "A Tribute to the Sea", with which Ferretti, the yard that has become a worldwide ambassador for Made in Italy excellence, paid homage to the inspiration behind its success - the deep blue waters of the sea. Through the music of the Philharmonic Orchestra of La Scala, conducted by Gustavo Dudamel, chairman Norberto Ferretti, along with friends and collaborators, was offered a depiction of his intimate dialogue with the sea, the "special relationship" that has allowed the yard to blend form and function in the construction of unique crafts. For one night the sea came to Milan, to receive Ferretti's special thanks. On the heels of its best sales year on record, Grand Banks Yachts last week welcomed dealers from around the world to its 2008 Annual Dealer Meeting. The two-day event, held near the Grand Banks factory headquarters in Singapore, was an opportunity to highlight important new products and accomplishments by the Company - and to recognize the outstanding achievements of its top dealers. A major highlight of the event was the introduction of the first Grand Banks 41 Heritage EU, which will make its public debut in the US during boat shows this fall. Featuring the joystick-controlled Zeus propulsion system from Cummins, the 41EU is a bold new take on the iconic Grand Banks trawler design. The meeting also included a comprehensive tour of Company's 21-acre facility along the southern tip of Malaysia, just across the Straits from Singapore. Dealers were treated to a comprehensive factory tour that included a demonstration of new resin-infusion techniques, along with a look at other significant production advancements at Grand Banks. The dealer meeting was hosted by Rob Livingston and company Chairman and CEO Bob Livingston, who announced his forthcoming retirement during the meeting. The senior Livingston has stood at the helm of Grand Banks Yachts for 34 years, leading the Company to its position today as a globally recognized and highly respected brand. He will continue to serve as Chairman of the Board following his retirement as CEO. Those accomplishments include overseeing a major global expansion of the Grand Banks Dealer Network. Attendance at the Dealer Meeting included new dealers from Australia, Russia, Turkey, and Croatia. They joined longstanding dealers for an opening night awards ceremony at the luxury resort island of Sentosa. The presentation recognized dealerships and individuals that have attained outstanding results as Authorized Grand Banks Dealers. Boatworks Yacht Sales, with offices in Connecticut, New Jersey and Rhode Island, received the 2007 Dealer of the Year Award by leading all others in total GB sales. Regional dealer awards went to Passage Maker Yachts in Seattle for Top US West Coast Dealer, Grand Banks Italia for Top European Dealer, and recently appointed R Marine for Top Dealer in Asia and Australia. The overall best individual sales award went to Paolo Murzi of GB Italia. British luxury boatbuilder Princess Yachts has commissioned UK whirlpool manufacturer Splash-Tec to produce a range of spa tubs for Princess superyachts.The Cornish bath firm has developed tubs with a range of features such as underwater mood lighting and teak finishes to compliment the decor of Princess's 95ft (29m) vessels.Family-run business Splash-Tec built the commissioned spa tubs by hand at its facility in Falmouth. Based in Plymouth on Devon's border with Cornwall, Princess was established in 1965 and operates from 94,000m sq of factory facilities. The staff at Gold Coast luxury boat builder Riviera came together today for a barbecue and a beer to celebrate the launch of the company’s new 70-foot luxury cruiser. They packed into the company’s new $3.6 million Aftermarket centre in bright sunshine to listen to CEO Wes Moxey share recent feedback from Dealers. He said that larger boats continue to attract strong interest. Mr Moxey said the company expected a strong result at the Sydney show following a successful Sanctuary Cove Show. Private equity firm Venice, part of the Palladio finance group, has acquired the majority of Tecnomar, a superyacht builder in Viareggio, northern Italy, according to Italian news agency AGI. Venice has bought 70 per cent of Tecnomar's capital from the Sarti family and has sanctioned an increase in capital to fund growth. The minority share in the company is held by the Zappelli brothers, who will continue to oversee yacht construction, and by Maurizio Magri, who recently took over direction of the firm. Tecnomar builds open and fly bridge motor yachts from 24m-50m (82ft-164ft). The firms turnover grew from €12m in 2004 to €40m in 2007. The company has launched over 200 yachts and employs 40 people directly. Tiara Yachts has announced plans to reduce its workforce by about 25 per cent after several rounds of job cuts. A company statement said that it will indefinitely lay off 95 workers from its Holland, Michigan facility during the first week of August, and place 70 workers on temporary layoff next week. The company laid off 110 workers earlier this month, and 10 more in June. According to a story on mlive.com, that will lower the workforce from 790 workers to 575. Tiara's cutbacks come after years of double-digit expansion for the high-end yacht brand. The company announced a US$14 million expansion in the fall of 2005 that resulted in 300,000sq ft of new production space. They call it the War Offshore. 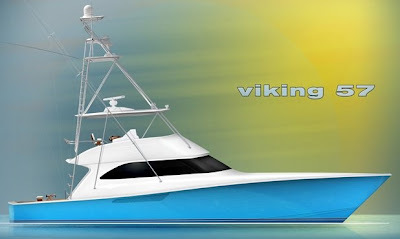 In actuality, the Viking/Ocean Showdown held July 9 – 13, 2008 is a family oriented fun-filled fishing tournament and this year’s victor is Viking Yachts. The event features two days of fishing, a pool party lay day and great local food and live entertainment. This year’s event was marked with superb weather and the fishing was good, too. Pat Healey, aboard the Viking 68, with Capt. Mike Brady at the helm, had two white marlin and captured the award for most points in the white marlin category. The Viking 68 also released two blue marlin. Tom Tucci aboard the Alyson Rose took home the award for the most tuna. Eleven-year-old Meg Seaton fishing aboard the Viking Nightwind bested all the other women and won Top Junior Angler and Top Lady Angler. Way to go, Meg! Meg follows in the footsteps of 13 year-old Alexia Turner, who was last year’s Top Junior Angler and Top Lady Angler while fishing aboard the Foolish Pleasure. These ladies can fish! In all, 17 white marlin were released and 12 blue marlin were turned loose during the event which is based at the beautiful Canyon Club Marina in Cape May, New Jersey. In addition, 34 tuna hit the scales and 19 dolphin (mahi mahi) also were weighed in. It was a great tournament for all and at the Saturday night Awards Banquet, the perpetual Showdown trophy once again went home with the Viking family. Viking Yachts recently concluded its annual domestic and international dealer conference late last month at the Trump Marina in Atlantic City, New Jersey. There was no sugar coating of the current business climate but presentations by company owners, Bill, Bob and Patrick Healey, as well as the sales and marketing departments were upbeat about the new product line up. During his opening remarks, Patrick Healey, Viking’s Executive Vice-President, announced the dealers could expect to see four new models at the February 2009 Miami Yacht and Brokerage Show. The models include the new Viking 82 Convertible, which already has 13 signed contracts, a new 57 Convertible, a new 46 Convertible and a new 46 Open Express. Drawings of two smaller models, a pair of 42-footers, also were shown slated for delivery in late 2009. Dealer interest buoyed with enthusiasm when it was announced the smaller models would be offered with Volvo Penta’s IPS drive system. Dealers also received presentations from Viking sister companies, Palm Beach Towers and Atlantic Marine Electronics, which do most of the OEM installations on new Vikings, and updates and upgrades on existing Vikings, as well as other production and custom boats. Choosing AME and PBT allows a customer to take delivery of his new Viking turnkey ready. Dealers also learned that AME had reached a milestone with its 400th installation in its five-year history and that all AME technicians had attained NMEA certification. Updates pertaining to Viking’s two service centers in Riviera Beach, Florida, were presented, along with informative discussions by representatives from G.E. Capital Solutions, Caterpillar, MAN and MTU. The three-day event also featured ocean sea trials aboard seven new Vikings and one-on-one meetings with dealer principals and Viking sales staff. On their visits to the Viking facility, dealers saw the results of the last phase of Viking’s recent capital revamping and expansion plans, which included a new 130,000 square feet building for the 82 Convertible and production lines one and two, the company’s waste water treatment plant and its 165 feet tall test tower for the purpose of installing a wind turbine to generate electricity for plant operations. Dealers also viewed the first 82 Convertible under construction, Viking’s resin infusion process and the company’s two five-axis milling machines busy with new boat projects. To be launched in September for the Fort Lauderdale show is a new Magnum 70 designed by Italian architects Lazzarini Pickering. Equipped with twin 2400HP MTU diesels coupled to Arneson surface drives, this new Kevlar and carbon fiber composite hull will reach top speeds of close to 70 MPH. Interiors are custom built to the owner’s specifications and can accommodate up to three double cabins. For the first hull of this new model, Magnum ordered beautifully designed interiors from Italy for the client. We gave details about the new 50 replacing the Bestia model last November, but being ready to be launched for the Fort Lauderdale show, here we go again with some more information direct from Magnum. Designed by Luiz de Basto, the new 50 will have a sleek and aggressive deck. She will be equipped with twin Caterpillar engines of 1800HP coupled to surface drive, this new Magnum will reach speeds of close to 75 MPH with unbelievable acceleration. As usual to all of any new Magnum, it will be custom built to clients’ specifications. Both of the new models should be available for testing just before the Fort Lauderdale boat show, so if you want the best in a high performance sport yacht, I will be the first in the line to try any of these untamed sea beast of performance and safety. Present at the show in Fort Lauderdale will also be an 80 model, hull no.2 for the flagship of the legendary USA builder was launched in February of 2008 and presented officially during the last Miami show. Beneteau presents its entry level Monte Carlo model with the new 27. Thinking that this range started about 2 years ago, it's impressive to note that now the French builder has already 5 models up and running in production with more to come in the future. The entry level Monte Carlo is a smart little boat featuring a well planned cockpit layout, with a c-shaped settee to starboard and a wet bar with grill, wash basin to port. Inside it features 2 sperate sleeping areas, with a v-shaped double berth forward, a double mid cabin and a separate head to starboard. The 27 Monte Carlo features also the Air Step Technology introduced by the French builder for this range and follows the exterior design theme of Andreani following the modern Monte Carlo lines outside and inside. An important model will be presented by the legendary Bertram, the 540 set fitting perfectly in the range of top class sport fisherman between the 510 and 570 models. Following the Zuccon design philosophy the line has enjoyed since the take over by Ferretti Group, the 540 will deliver modern creature comforts of latest generation while keeping the top performance and seakeeping this brand enjoys. Bertram says the new model is what they call a prototypical vessel, created for the fisherman but with plenty of luxurious on board comfort for the whole family. 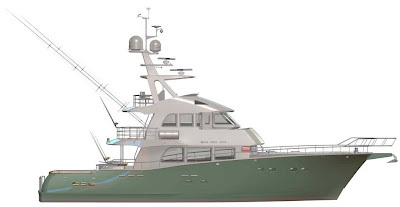 Among the unusual features for a sport fisherman will also be the amount of natural light inside, thanks to natural Eucalyptus wood finishing, a full wrap around windscreen, and big windows in the mid-ship master cabin. Another unusual feature will be the galley located in the aft part of the interior upper deck which thanks to the sliding of this electric window becomes a bar on the cockpit, a feature seen on another yachts from the group but very unusual for any Sport Fisherman. With over 200 launches to its credit, Dutch builder Feadship presents the new 39 SL, the second in the line of semi custom yachts following the F45 Vantage presented a year ago. This new launch from Feadship is all about innovation with a standard hull and deck platform but a completely customized innovative modular project up top which in fact can make all of the 39 SL look different to any viewer. In fact on the outside she is offered in three versions Mk.1 pictured above, Mk.2 the more modern looking and Mk.3 which combines the classic modern similar to the latest Feadship launches. The SL 39 platform really offers a new meaning to semi custom yacht projects, thanks to the innovative modular system which can virtually make all models in this line look different not only on the inside, as is the majority of yachts in this size but also on the outside. Goldstar is the line from Cantieri Estensi of traditional cruisers and yachts based on the classic design of the lobster boat, a type of craft which made boating history in the US in the early to middle of the twentieth century. This new 420 Goldstar C is the classic evolution of the 400 Goldstar S, featuring a bigger cockpit, wood finished patio door just as tradition should be and a squarish stern with integrated bathing platform. Length wise she is identical to the 400 with the same beam 4.00 metres, but also the same overall length 12.90 metres. Power comes from a pair of 400 hp engines, and certification is the maximum usually given to European build boats, that is a CE A rating. A new project from Estensi also in the Goldstar line, presenting another evolution to the 540 model, with the new 560 Goldstar Fly C, with designer Maurizio Zuccheri following the competition and offering a flybridge version to the flagship. Apart the flybridge other important difference will be the classic squared stern, which adds space to the cockpit, with the manufacturer claiming it to be the most spacious of the category. Pictured here is hull number one of the new Squadron 55 already looking set to be another classic in the making, as was its predecessor the old 55 Squadron produced from 1996 till 2004, which I believe was the most successful of the line with over 150 deliveries in an 8 year production space. The new Squadron offers sleek lines and beautiful external shapes taking a lot from the bigger 68 and 78 models. Inside this new model is a spacious affair with big windows, offering natural light and airy ambiance unthinkable in a boat of 16 metres. The magnificent full beam master stateroom is one of the finest in this size, with panoramic hull windows, state of the art ‘electro-opaque’ bathroom walls and an immense, cabin-width wardrobe. The saloon, galley and guest accommodation, follow what you find in the master cabin with unmatched light, space, facilities and comfort. From the expansive, impressively equipped and beautifully proportioned flybridge, to the fabulously appointed forward cabin, the 55 Squadron sets completely new benchmarks for both luxury and quality. Looks like another world-yacht is launched by one of Britain's finest builder, whether it will have the success of the old 55 is now just a question, that only a couple of production years can answer to, but the making of a successful boat are here. A vision of optimum design, advanced engineering and spacious, luxurious life onboard, the new Nordhavn 120 beckons those who consider the world their playground and the ocean, a home. Beautiful and sleek yet big and brawny, the N120 gracefully carries the owners and up to eight guests, indulging them with spaciousness and richness. With four decks, four king-sized guest suites and a tantalizing owners’ suite, she may rightly be considered a personal luxury ocean liner. Using only the finest hardwoods and finishes, each interior can be customized to her owners’ wishes. And Nordhavn will work closely with a client’s personal designer ensuring the exact degree of elegance desired will be satisfied. But the real beauty of the N120 is that she is built to handle the seas as well as she handles her guests. Naval Architect Jeff Leishman has made her waterline length a sweetspot in terms of wave period, and in doing so, makes long passages a very comfortable experience. Encompassing the highest degrees of talent, experience and imagination any production manufacturer can offer, the N120 represents Nordhavn’s commitment to the future while continuing to stay true to our roots. 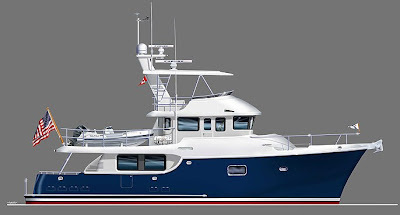 She’ll be constructed at South Coast Marine which also builds several of our smaller models. The N120 is a world-class, ABS-certified yacht destined to be the choice of a new generation of travelers expecting the best and finding their expectations exceeded. The new luxury Nordhavn Expedition Yachtfisher can take you there on her own bottom. At 75 feet, the Nordhavn EYF will present true offshore capability and the range needed to explore, experience, dive and fish the most productive fishing grounds in the most exotic places the world has to offer. All of this, plus the same comfort and security Nordhavn owners have become accustomed to. During the past 25 years, Nordhavn has earned a reputation for designing and building highly capable seaworthy power cruisers. True to its oceangoing pedigree, the EYF has a range of up to 4,000 miles and is equipped to be self-sustaining for extended stays in remote parts of the world. Built to the highest international standards and extensively outfitted with the finest equipment, the new Nordhavn 75 EYF was created for those with a passion to explore exotic fish and dive sites on their own luxurious yacht. While an increasing number of sport fishermen are having their boats shipped long distances by yacht transport companies or having to choose charter boats in order to fulfill their passion, the EYF will allow her owners unlimited adventure in safety and complete luxury. The 75 EYF is a twin-engine, full displacement yacht that carries 5,000 gallons of fuel and 600 gallons of water. It displaces 235,000 lbs. and is designed to cruise economically at 12.5 knots with a range of 1,850 nautical miles. At its maximum cruising speed of 13.5 knots, its estimated range is 1,237 nautical miles. Top speed is an estimated 14.3 knots. One of the most popular Nordhavns to be launched, the 55 appealed to those looking for a yacht possessing the most modern conveniences and enhanced living arrangements while still maintaining superior seakeeping qualities. One of our “third generation” models in which aesthetics was given as much consideration as function, the Nordhavn 55 quickly became a market favorite. For some, however, the added height of the 55 – while a proven design plus that ensures superior stability by allowing the engine, fuel tanks and water tanks to be positioned very low – kept the look decidedly more trawler-like and slightly out of proportion. To combat this allusion, PAE’s designers simply lengthened the decks by five feet. The result is the Nordhavn 60, a very sleek-looking modern passagemaker with the same fabulous interior features and hull form that make extended cruising an absolute pleasure. Of course, because length was added without measurable increases in weight, the N60 is slightly more efficient than the 55; she'll pick up about a third of a knot in speed. Another added bonus comes from the longer deck's carrying capacity which allows for a bigger shore boat to be stored. Aside from that, the only other change to be found is the optional switch to larger porthole windows in the owner’s stateroom. Nordhavn fans appear to like the new look of the N60. After the design was first made available to Nordhavn 55 owners, eight contracts were changed to the bigger boat The Nordhavn 47 is known as being a very large 47-foot boat and now P.A.E.’s designers have actually made it bigger by extending it by five feet. The Nordhavn 52, a slight evolution of its smaller sister, is quickly gaining popularity amongst buyers who love the interior space and offshore capability of the 47 but are looking for an updated look to their boat. The new N52 differs itself from the 47 with three central design modifications, each of which combines to make a sleeker and slightly more efficient boat. The most significant of these changes is a cockpit extension, which opens up the rear of the boat as well as elongates the yacht’s lines. But the benefits of added waterline length aren’t limited simply to aesthetics. The design team was able to work an extra (approximate) 200 gallons of fuel into the capacity of the boat’s tanks and in turn, bump up the range. To coincide with the elongated cockpit, the upper level boat deck was lengthened by two feet, a move that serves a dual purpose: not only does this offset the cockpit extension, it enables a bigger tender to be carried on top. Completing the enhanced look is the re-configuration of the flybridge. A purely cosmetic change (no features have been added or altered), the newly-styled flybridge is now more integral with the boat deck and pilothouse roof. Despite these differences, the N52 is exactly like the 47, and the rest of the Nordhavn line, in her robust construction, superior level of fit and finish, and an ability to deliver her owners anywhere they wish to travel in safety, comfort and luxury. This particular make, takes me to the roots of my passion for boats, when as a young bloke I used to see boats in the local harbours and then go at home and search in the various magazines to find what the mysterious models those with no information on the hull or topsides could be. This is how I discovered San Juan yachts, when in December an extremely wonderful lobster boat was gracing one of the local marinas, but this boat had no means of identification. Browsing in the Internet did not prove successful at first, until I stumbled on a message board discussing lobster boats and there it goes, I finally discovered what the nice lobster boat was, the San Juan 48! Here is the latest model from this youngish ten year old builder, founded 1998, in Washington. The latest SJ40 FB for Flybridge, another stunning traditional cruiser from SanJuan presented during the last Miami show, sitting in the range between the 38 and 48 Flybridge. The general interior arrangement shows an open plan layout with a master cabin forward, a galley to port and a spacious head to starboard. The cockpit with its two sun loungers sitting in the centre of the boat is also a spacious affair. Jeanneau announces the project of the 50 Prestige, a new flybridge model which will be the flagship model for the high range of stylish cruisers and yachts from the French builder, designed by Italian architect Garroni. The little information so far provided by Jeanneau, announces a full beam owners cabin with big side view windows, and also of a 3 cabin 3 head layout, looks pretty spacious below for a 50 footer. Jeanneau also advices a very spacious flybridge deck, distinct saloon dining areas and a well appointed flybridge. The design picture above shows also a natural light filled interior up top in the socializing areas but also in the cabins. Power is from Volvo D9 twins at 575 hp each. Expected launch is for the 2008 Autumn boat shows, with what will be a very competitive price. The Prestige 50S2 benefits from an eye-catching new design improvement, featuring contemporary lines along the sport top and a large, integrated tender garage. This skilfully designed new styling results in even greater interior volume. With the tremendous success of the Prestige 50S, launched in 2007, Jeanneau demonstrates its capacity to evolve and to develop a very distinctive style. Luxurious details and the exceptional quality of materials onboard lend the Prestige 50S2 its exclusive signature style. Available in a two-cabin or a three-cabin layout, this new Prestige 50S2 will be presented at autumn 2008 boat shows. Jotun’s Jorn Tandberg and Inge Brigt Aarbakke produced arguably one of the great drives in one of the most spectacular races seen in Class 1, scything their way past both Victory boats and back-markers to win today’s BMW Norwegian Grand Prix in Arendal, sending the tens-of-thousands of home supporters into a complete frenzy. Last year’s winner, Victory 7 finished second ahead of team-mates and Championship leaders, Victory 1. Starting from second on the front row, Jotun’s all-Norwegian pairing, running in only their second race together, found themselves a place down by the end of the opening lap with both Victory boats ahead of them, with Qatar 96, the pole sitters trailing in fourth. By the end of lap six, with both Jotun and Victory 1 having taken one long-lap, they came into the start-finish turn side-by-side. Jotun had the inside-line, held their nerve, went tight in the turn and moved into second place. Five laps later, with the leading trio having completed both mandatory long-laps, it was Victory 7 turn to feel the heat as Jotun bore down on them - again as they approached the start-finish turn - and despite a pair of back-markers in front of them, Jotun scythed their way through the traffic - at one point coming together with Victory 7 - before passing them on the outside of the turn to take the lead, going on to win the 17-lap, 96.21Nm BMW Norwegian Grand Prix by 13 seconds. Despite a spectacular start, moving from fourth on the front row to lead at the first turn and for 11 of the 17 laps, Victory 7 had to settle for second place. Second spot for Victory 7 keeps the European title defence alive, reducing the gap to team-mates Victory 1 to 13-points with one race to go. And although their winning streak is now over, third place for Victory 1 means they still have a commanding 21-point lead in the overall title race. For Qatar 96, despite the advantage of starting from pole position, the race was lost at the start, and the points’ gap that they had hoped to reduce between themselves and the leaders has now increased. Qatar 95 maintained their pole status throughout, finishing fifth ahead of a solid performance by Tom-Barry-Cotter and Pal Virik Nilsen in Maritimo, who were given a wild card entry by the event organisers, and proved to be the strongest of the middle order. After a frustrating weekend beset by technical problems, Foresti & Suardi went the race distance picking up points in seventh place ahead of Roscioli Hotels Roma, who despite limited time on the water this weekend due to repairs being made to their boat, also picked up points with Carrasco gaining more valuable race experience. But there was disappointment for Qatar 9 and SeveneleveN, both retiring with technical problems. Ferretti presents the project of it's second Altura model, the 840 following the 690 launched in 2005 by the World respected Italian yacht builder. As was the case with the 690, the new 840 model follows a different concept of yacht design, with the owners cabin located aft a striking feature of the Altura range, complemented with other new ideas for max onboard comfort and practicality. The 840 Altura adds the bonus of difference with features like the exterior deck layout offering ample spaces for maximum open air living, the totally separate dinning galley area situated in between the main deck saloon and cabin areas, and the interior helm station situated in an upper raised position for maximum view and entertainment by the guests. Estimated performance for the new Altura model is of 30.5 knots max and a 27 knots cruise, powered by latest MTU 12V 2000 engines of 1823 hp each. Ferretti and Zuccon have again broken the barriers of normal yacht schematics with the new 840 Altura, developing the aft cabin to new design border but also adding to it different solutions making this new Ferretti super yacht stand out with it's pure genius as a "Villa on the Sea". Think of it this way, if you like it you will not find much similar designs to it. 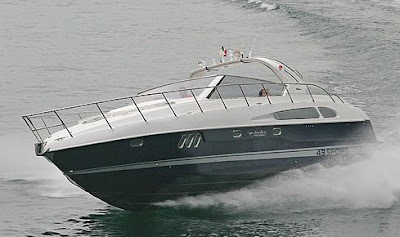 More then any other style of boat, Riviera is famous for its Flybridge models. All the knowledge and skill acquired over more than a quarter of a century is to be found in this exciting new model the 38 Open Flybridge. The lessons learned in this Aussie builder long history are evident, proving that this is not just another ‘Open Flybridge’, it is a fresh expression of commitment to make a safe boating experience. From the creative use of space to the to the implementation of the latest equipment and systems technology, every facet of the 38 Open Flybridge has been subject to the most rigorous consideration. The interior accommodation is a two cabin plan with the master stateroom forward featuring a spacious island bed and the individual guest cabin with two pullman-style bunk berths located to starboard. The interior also wins well with its appointed well equipped galley, the spacious saloon and newly designed ergonomic helm station. The new 38 Open Flybridge continues Riviera commitment to build vessels inspiring confidence and delivering a maximum standard. Ferretti Group with it's Mochi Craft brand challenges the nautical world with this new project, the 23 Long Range zero emission hybrid propulsion explorer yacht, and the new FER.WAY hull, an innovative special hull designed by the Ferretti Engineering department for maximum efficiency at the range of 10 to 15 knots. The 23 Long Range is a revolutionary three deck motor yacht and with it Mochi Craft rewrites the history of the international nautical sector. Driven by the passion of Norberto Ferretti and made possible by the years of research carried out by Ferretti’s AYT Advanced Yacht Technology division, led by Andrea Frabetti, in collaboration with the Studio Zuccon International Project the new 75 feet Long Range embodies an unprecedented distillation of innovation and technology. Conceived for lovers of long-distance cruising and extended voyages, the Long Range 23 is the first craft to obtain the RINA “Green Star Clean Energy and Clean Propulsion” certification, the most rigorous certification standard that can be applied to a pleasure craft. After creating the Italian Lobster Boat Style with the Dolphin line launched in 2003, Mochi Craft now enters the Explorer Yacht market with two new solutions that open up new horizons in the international nautical panorama. First is the revolutionary Zero Emission Mode hybrid propulsion system. The new hybrid propulsion system allows the craft to be managed in 5 different ways, easily controlled through a touch-screen display ranging from the traditional diesel function to the zero emissions mode, using different combinations of diesel engine, electric engine, inverter, batteries and generator. The 23 Long Range features the most cutting edge technology now on the market, offering owners the opportunity to select the propulsion mode that best reflects the needs of the moment – sailing in unpolluted areas with total respect for the environment, lying at mooring with zero emissions while accessing all the boat’s electrical facilities or entering and leaving port in absolute silence while creating no smoky exhaust emissions. The other noveltly is the new FER.WEY (Ferretti Wave Efficient Yacht) trans-planing hull ensuring high hydrodynamic efficiency than other planing or displacement hulls, thanks to the innovative design of the depth surface, permitting the boat to avoid adopting the usual stern-down attitude when speed is increased. The new FER.WEY hull also reduces the typical roll experienced by displacement hulls and improves static stability by up to 50%. Its special design, with longitudinal tunnels protecting the props and a horizontal base on the bow bulb, allows the boat to rest on sandy bottoms and stay moored in locations subject to tides. The two technologies the hybrid propulsion system and trans-planing hull, combine and reinforce each other in a craft that offers a revolutionary design concept and solutions. The 23 Long Range is designed for spending long periods at sea in maximum comfort and total safety, backed by exceptional environmental awareness, the perfect mix of avant garde technology and Made in Italy design. The external lines are a synthesis of the Nordic work boat tradition and refined Made in Italy taste that Mochi Craft has skilfully expressed since 2003. In the interiors, the choice of prized materials, warm woods like teak and oak, natural fabrics and cutting edge design solutions redefine the concept of on board luxury and quality of life in the “expedition boat” market. The new 23 Long Range will be offered in a 3 or 4 cabin version with a 2 berth crew cabin aft and an optional captains cabin on top of the fly bridge by the wheelhouse. As for the performance, the new 23 Long Range offers the new innovative FER.WEY hull, which already offers great stability, but complemented by the Mitsubishi ARG, Anti Rolling Gyro System, which is worldwide exclusive to Ferretti which cuts roll caused by wave motion at anchor or under way by up to 50%, and stabilising fins, both mounted as standard. The 23 Long Range 23 is powered by twin MAN Common Rail power options, a 500hp and an 800hp version. 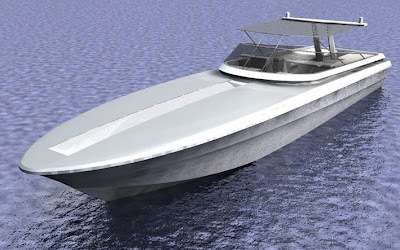 Mochi is estimating cruising speeds of 13.5 knots and top speed of 16 knots, for the 800hp version. 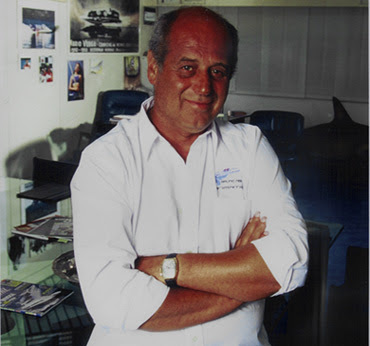 PowerYacht gives the blessings to World renowned boat builder Bruno Abbate who yesterday 16th July in a Milan hospital left us for the better World. Bruno Abbate 57 year old was son of Guido Abbate a renowned wooden boat builder from lake Como Italy. The Abbate boat building tradition goes back to 1873 when Giuseppe Abbate, grand father to Bruno started building fishing and carrier boats on Lake Como. In 1930 Guido Abbate, the father of Bruno mounted the first engine on a flat bottom boat, which started the Abbate fame for fast boats. Bruno Abbate founded his own yard in 1978, which started the expected change for the family to fiberglass construction. In 1987 with the CUV Primatist powered with triple Isotta Fraschini of 900 hp each, Bruno won the European Class 1 Championship, along with this the mono hull carried on winning the Italian and Mediterranean titles for the same year. A win for Victory 1 in this weekend’s BMW Norwegian Grand Prix in Arendal, round four of the class 1 World Powerboat Championship, would secure the Dubai pairing their first European Championship title and a sixth for the Victory Team. The Victory Team has an impressive record in Arendal winning six out of the 11 races held since 1994 and with Victory 1 unbeaten this season, on present form, appear to be unstoppable, and with a 24-point advantage over their team-mates in Victory 7, they look all set to add their names to the trophy. However, should Victory 7 take the win, the battle for the European crown will go down to the wire and be decided in the Romanian Grand Prix in Constanta-Mamaia in August. For the Qatar Team, it seems that whatever they do, Victory can match or better it, lying in third place in Qatar 95 and Qatar 96 in fourth, know that they will have to produce something extraordinary from somewhere, or else hope that the Championship leaders have a problem if they are to reduce the points gap in the title race. But Norwegian waters have, in the past, proved a successful hunting ground for the Qatar Team winning in Oslo in 2004 and Trondheim in 2005, and with Curtis a six-times winner in Norway winning in Arendal in 2001 this could be the weekend that Qatar ends Victory’s winning streak. Proving to be one of the most solid and reliable outfits this season is that of the Italian team, Foresti & Suardi, who have carved out three well-earned fifth place finishes and in fifth spot, are currently the highest-placed European team. But Norwegian hopes for a repeat ‘home win’ last enjoyed in 2006 by what is a fervently partisan following in Arendal rest firmly on the shoulders of Jotun, which showed real pace in Moscow going second quickest in qualifying and but for a broken propeller, would certainly have challenged the front runners and have upped the stakes to be real podium challengers. Roscioli Hotels Roma faced a race against time to repair their boat and be ready to start this weekend, after a harrowing moment during the last race, when they lost control as their steering broke coming off their long-lap and, unable to steer, they hit the dock, damaging the front left sponson. Giorgi Offshore will be desperate to get SeveneleveN back in the points after two frustrating races. After a solid performance in qualifying in Moscow, an engine problem during the race with SeveneleveN running in fifth place ended what looked like being their best performance of the season. The new Nicolini-designed and built race boat, Qatar 9, will get only its second outing in Arendal, hoping for better luck than in Moscow, where a broken propeller cut short their race on lap one, after they had impressed during all practice sessions and in qualifying on their debut in Moscow. This weekend also sees the return to Class 1 action for Tom Barry-Cotter and Pal Virik Nilsen, given a wild card entry by the Championship Organisers. Last season’s youngest pairing who this year lifted the Australian Offshore Superboat Championship, winning four out of six races will step back into the Mercury Class 1 powered Tencara they raced last year, and run under the colours of Maritimo Offshore. For all the teams the biggest challenge of the weekend will be to master the demanding 5.65Nm circuit run on Tromoysund and Galtesund fjords, with its fast sweeping turns, narrow straights lined with rocky outcrops and islands, providing a stern test of the pilot’s skill and nerve over the 17 lap, 96.70Nm race. Beneteau continues to upgrade its Monte Carlo range of fast modern sports cruisers and in this case enriching the model to a more alternative customer base. The new Hard Top version of the 32 Monte Carlo, aims at growing a wider audience and making this craft an all weather fast sports cruiser, being sun or rain. All the other features of the 32 Monte Carlo are still there, so if the hard top was the only item missing for the purchase, Beneteau and designer Andreani made sure to put it so as to convince you. As for the technical features of the Monte Carlo range are all here of which is the most important efficient Beneteau patented air step technology. The project for this big 92 Predator Sport model, follows the new turnaround of putting a small sport coupe style helm on top of the hardtop. As usual for Sunseeker the new Predator Sport will have a vast choice of drive systems, like conventional shafts, surface drives and more exhilarating jets. Standard interior accommodation is a four guest stateroom all en-suite cabins, and crew quarters for four members. The new 30 Metre Yacht model project, replaces a huge success for Sunseeker that was the 105 Yacht model. Accommodation for this new model is for up to eight guests, and crew quarters are for four members. The 30 Metre Yacht model will stand in the middle of the Yachts range of big flybridge yachts from the renowned British builder, entering into important super yacht territory. When this project will be launched it will be Sunseekers bigger launch to date at a length of over 38 metres, beating the current 37 Metre Trideck Yacht by just 1 metre. Its good to see that the British builder still puts fast sports orientated models as it did in the past. Sunseeker is promising great performance for the new flagship of all the marquee and the performance yachts range. Standard accommodation is for ten people, with crew quarters for eight members. It was another difficult weekend for the P1 teams, what was called a tough and fit only challenge from the crews, with the med sea showing for another time this year his dark side. Tunisia proved a big challenge for all teams, with issues like high temperature, big swell seas and attrition all playing a big part in the difficulties for the boats and there crews. The Sunday Evolution team race with only 3 boats finishing the race was just testimony to all the problems the boats faced. Now it will be a longish 2 month break for the championship with a teaser in between for the classic Cowes Torquay Cowes race, which the P1 Management is promoting. The 60 GFN Gibellato crew continued their impressive 2008 form in this weekend’s Tunisian Grand Prix of the Sea Evolution Endurance race. The Italian crew pipped the 88 Kiton Outerlimits and 99 Fountain Worldwide 1st4boats.com entries in a dramatic race of incidents and attrition that proved a real test for the stamina of both boats and crews. With 40C temperatures on the shore, and probably 50C+ temperatures in the closed canopy Evolution cockpits, the battle for the lead in the early stages of the event was a fierce four-way duel between the 10 Fantastic 1 Cigarette boat, the 69 Honeyparty.com boat, and the 77 Lucas Oil team. Closing fast on this mix were the reigning champion and current class-leading 99 Fountain Worldwide 1st4boats.com team, but just as the British-based squad seemed like they were about to do their usual job of emerging ahead of the pack, they yo-yoed from fourth to first, and back to fourth again after a dramatic first corner spin. Things weren’t any easier for the leading pack as one-by-one the 10 Fantastic 1 Cigarette boat, the 69 Honeyparty.com boat and the 77 Lucas Oil team dropped by the wayside with mechanic problems, many of which were related to the intense heat. Going into the closing laps, the 60 GFN Gibellato team emerged from the gaggle leading the 88 Kiton Outerlimits boat, the 99 Fountain Worldwide boat and the sole remaining survivor, the 53 Pignolo 53 entry. If such tough conditions and unpredictable results continue for the Sprint race, we could well have some significant changes at the top of the Evolution class points standings. The Evolution Sprint race round of the Tunisian Grand Prix of the Sea proved as much of a test of stamina of man and machine as Saturday’s Endurance race, with the 10 Fantastic 1 Cigarette Racing Team Europe squad, the 76 Italcraft boat and the 88 Kiton Outerlimits emerging the top-three survivors from an attrition-marked race. The first few laps provided some of the closest racing of the season so far as the 10 Fantastic 1, the 60 GFN Gibellato, the 88 Kiton Outerlimits and the 99 Fountain Worldwide 1st4boats.com crews battled fiercely for position. By the end of the first lap, though the 99 Fountain Worldwide crew were slowing with broken steering, and the 60 GFN Gibellato boat was surging ahead into a dominant lead. As the 88 Kiton Outerlimits boat slowed with an engine problem, the four-way battle turned into a two-way scrap that in the closing laps soon became a solo performance as the 60 GFN Gibellato boat followed the lead of the midfield runners and crawled to a halt. That put the 10 Fantastic 1 boat back ahead, with the US-backed Italian-run team scoring their first Powerboat P1 victory on a weekend when regular throttleman Lino Di Biase was replaced with Class 1 racer Matteo Nicolini. The only joy for the 60 GFN Gibellato team was that the high rate of attrition meant they were able to score third place, and secure the overall Tunisian Grand Prix of the Sea honours from the 10 Fantastic 1 boat and Max Ferrari’s 53 Pignolo53 entry. 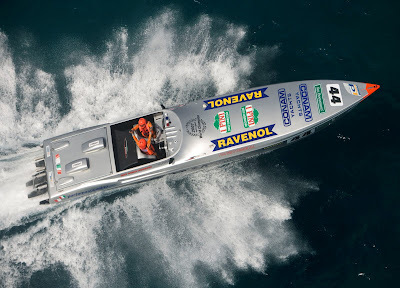 The reigning champion 44 Conam Yachts team took their sixth win of the 2008 Powerboat P1 season in Saturday’s Tunisian Grand Prix of the Sea Endurance race, but the Italian-based outfit was nearly beaten on the track for the first time this year. The 07 VoomVoom.com boat took the initial lead on the run through the first corner, they were passed on the back straight by the 59 Saho Offshore Ranas boat. The twin-canopy boat then powered into a comfortable lead that they held for the first half of the race. On lap seven, though, the 59 Saho boat fell off plane on the far side of the course, and despite a concerted effort to restart the race, they were forced to pull into the harbour. That gave the lead back to the 44 Conam Yachts crew, who had quickly worked their way past the 07 VoomVoom.com boat and chased 59 Saho as they opened up a clear gap over 07 VoomVoom.com and the rest of the field. Ultimately, the 07 VoomVoom.com crew took second, but it was a close run thing. The 38 Baia High Performance mechanics had worked all through the night to make their Donzi hull seaworthy after it was inadvertently dropped on the dock while being craned out of the wet pits on Friday afternoon. After just making the start of the race, they powered their way through the field to a well-deserved podium finish. The 05 Team Tullio Abbate Wild Card entry, the 22 Big Sergio Al & Al boat and the 11 Team Sunseeker crew rounded out the top six finishers. There was disappointment for the 47 Silverline Buzzi Bullet crew as they were forced to miss the race after suffering a seized engine in final practice, while the 08 Phoenix TV and the 46 Spirit of Portomaso boats retired. The SuperSport title-leading 44 Conam Yachts crew took their seventh win of the year in the Tunisian Grand Prix of the Sea Sprint race, securing overall Grand Prix of the Sea honours at the same time. The double win allied to their 50-point bonus for completing the first half of the year without an engine change gives them a 190 point advantage in the championship points table. The 07 VoomVoom.com squad currently 44 Conam Yachts closest challenges were the only team to stay within touching distance of the Italian reigning champions at the start of the race, but Tedeschi and Ciantar once again quickly pulled out a comfortable lead that proved impossible to beat. A second second place of the weekend for the 07 VoomVoom.com squad gave them runner-up spoils in the Grand Prix of the Sea trophy chase. 08 Phoenix TV took the final podium spoils of the Sprint race, while fourth place was a superb result for the returning 11 Team Sunseeker. After a two-race sabbatical following the sinking of their boat in Marseilles, France, this was a fantastic comeback weekend by the British squad. The 05 Team Tullio Abbate Wild Card entry edged the 47 Silverline Buzzi Bullet boat and the 22 Big Sergio crew in the final race finishers to take the final Grand Prix of the Sea podium spot. It was double jeopardy for the Donzi crews, though, as the 38 Baia High Performance OSG team failed to complete the first lap and the 59 Saho boat failed to start with a transmission problem. The new white-and-blue flagship is here! A craft that is the most advanced combination of comfort, technology and prestige that the shipyard has ever produced. The Itama SeventyFive is the epitomy of innovation, right from its original design featuring high bows, a spectacular curved profile and a distinctively sleek structure created by a slim central roof. Here, innovation is taken to its foremost frontier with a record-breaking carbon fibre and glass windshield and avantop that are the largest in the sector. The use of carbon fibre signifies a saving of no less than 60% over the weight of steel, a factor that boosts performance incredibly in terms of speed and fuel consumption. The cockpit is truly extraordinary too. Measuring almost 60 square metres, it has been divided into four distinct areas to enhance efficiency. The prestige LED and optic fibre light fittings are of particular note here, as well as the large sliding sofas that can be joined to form a vast horseshoe seating 12 people. The standard layout includes 3 cabins and 3 bathrooms, as well as a twin crew cabin with its own bathroom. The splendid interiors include a spacious, full beam Master Cabin in the centre of the boat with low furniture, two “open view” windows on both walls, a comfortable chaise longe and modern, elegant materials for the tops and fittings, including natural teak with steel or lacquered white trims for the furniture, wengè parquet and woollen carpets for the floors, linen or white lacquered wall panelling and ash and Biscazza mosaic tiling for the bathrooms. With its twin 1823hp MTU engines combined with Arneson ASD 14 drives, the Itama flagship boasts peak speeds of up to 43 knots. And a limited VHP (Very High Performance) series reaches even an incredible 60 knots. The new SeventyFive, therefore, promises even the most demanding of open yacht aficionados an experience that has never been so rich and intense. Family Di Donna continues to upgrade it's range of fast planning traditional style Gozzo cruisers, presenting the project of the new 38 Serapo, standing between 33 and 42 model. 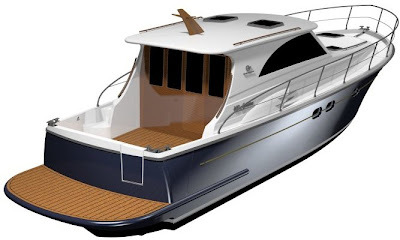 To be available in both Open and Cabin version, the upcoming Gozzo build in South of Rome, Italy proves itself a versatile cruiser, giving strong run for the money not only to other similar traditional builds but also to same sized sports cruisers, thanks to the space provided in the 2 well sized cabins. The numbers for the 38 Serapo are also very encouraging, with the builder estimating 33 knots of top speed with 2 x 370 hp engines, and a high capacity fuel tank of 1200 litres offering a range of 10 hours before refuelling. It will be curious to see if the 38 Serapo will stay with conventional shafts or as the 42 Serapo flagship will also be available with the more efficient IPS drives. Cantieri di Donna founded in 1960 constructs the new Serapo to CE B rating, and follows the successful cross over formula offering a Gozzo with the traditional lines expected from this type of boat but added with modern hull design, and clever layout planning above and below decks. Based on the lines of the successful 4300 T-Top Model, the new 4300 Sport is the full open version with the same hull lines, great interior space and unbeatable outside accommodation for a boat measuring over 13 metres plus. The interior layout follows the concept also of the T-Top offering a 3 cabin or 2 cabin versions, with 6 or 5 berth options. The 3 cabin, 6 berth option is something rare to see nowadays in this size, as most builders today focus for a more couples orientated 2 huge cabins layout, not the case for Airon Marine it seems with boats having more a family orientated plan inside. As for the engines powering the new 4300 Sport it is offered with various options and 3 different propulsion with the more efficient stern drives, IPS and traditional inboard shafts. Power starts from smaller 310 hp Volvo stern drives up to the 480 hp Yanmar shaft option. The terrific success of the Viking 74 was a premonition of greater things to come. So it should come as no surprise that an even larger Viking Convertible is in the works and its time is near. The Viking 82 Convertible represents another ground breaking design that only Viking can produce thanks to there in-house design team. Add this invaluable expertise to the thousands of hours racked up by the tournaments winning demo program, which helps dial in the features and performance required to make this yacht a winner. And finally, factor in the skills of more than 1,400 yacht builders that constantly seek ways to build a better boat every day and ladies and gentlemen you have one simply incredible sportfishing yacht. The profile of the Viking 82 is as recognizable at the dock of a yacht club banquet as it is on the 1,000 fathom line. The aggressively raked stem, the gorgeous sheer and the symphony of soft, seamless curves are a true feast for the eyes. But the subtleties are abundant and equally exquisite. The foredeck, for example, is flush with a gentle crown, which quietly hints at the substantial headroom below in each of the four staterooms. Freeboard forward is nearly nine feet, yet a modest three feet in the cockpit, which makes it safe and effortless for the crew to release billfish unharmed. 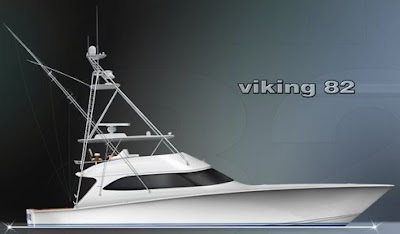 With a maximum beam of more than 21 feet, a lesser design would look chunky and clunky, but the Viking 82 wears its measurements like a runway model. This is one stunningly beautiful yacht. The substantial beam allows a salon of epic proportions with hand-finished teak joinery throughout. Entered through an electric sliding door, theL-shaped sofa with stowage below provides an excellent vantage to relax and enjoy the entertainment on the screen of the 52-inch plasma television, which rises from cabinetry on the starboard side. A dinette to port and bar stools at the granite topped galley counter to starboard create a relaxing and practical environment for formal dining, as well as grabbing snacks between marlin strikes. The galley is motoryacht class with gourmet appliances and stowage capabilities to cruise for weeks on end. A companionway to port leads to four staterooms, plus private crew quarters for two, which also includes a head with shower and access to the engineroom and cockpit. In the master suite located amidships for maximum comfort and privacy, there is a king-size bed with stowage below, a settee, a dressing table, an entertainment system, a chest of drawers and an oversized fiberglass shower stall in the head. An offset companionway leads to three additional staterooms, each with a private head and shower. Due to the generously sized staterooms, there is flexibility in the sleeping accommodations with both queen and double berth arrangements. With more than enough tournament trophies to stock a hardware store, the Viking 74 proved beyond any doubt that it could out dance a billfish with pomp and circumstance to spare. And you will fine these same elements in the cockpit of the 82 Convertible. Boasting 235 square feet of working space, the cockpit features Viking signature mezzanine deck beneath the flying bridge overhang for protection against sun and spray. Misters are available to counter tropical heat naturally. It also features built-in under-mount freezers, tackle and gear stowage, along with engineroom access. Insulated fiberglass bait wells, fish wells, and stowage wells, all with stainless-steel gas strut supports, are deep and spacious and a transom well can be set up as another live well or handy fish baling box. A walk-through transom door, port and starboard Glendinning Cablemasters, fresh and raw-water washdown systems, flush rod holders, stainless-steel hardware, side stowage lockers and a salon step box cooler briefly touch on the extensive list of standard equipment. The open flying bridge features a center helm console with power assisted hydraulic steering and electronic engine controls with trolling valves. Electronics stow neatly beneath clear acrylic panels for all-weather use and dual radio boxes provide additional room. Port and starboard bench seats conceal rod stowage below and built-in freezer and refrigeration space is standard ahead of the helm station. Three Murray Products helm seats with teak ladder backs and stainless-steel hardware and pedestals provide comfort and superb visibility. With its Palm Beach Towers custom tuna tower and magnificent Atlantic Marine Electronics package, the new Viking 82 Convertible will be fully outfitted for tournament fishing and long range cruising. The Viking 82 Convertible will be powered with MTU Series 2000 diesels affording a cruise speed of 30 knots and a top end in the mid-30 knot range depending upon engine selection, load and sea conditions. The new Viking 82 Enclosed Bridge is the more comfortable version for the 82 Convertible model, adding the extra comforts of an extra third pilot house deck. The air conditioned enclosed bridge will feature a center helm seat forward flanked by twin leather upholstered companion seats, a raised settee and teak table, wet bar with refrigerator and entertainment system. Access to the bridge is via the cockpit ladder or a spiral staircase from the salon. A control station on the aft deck eases maneuverability backing into a slip or working a fish near the boat. 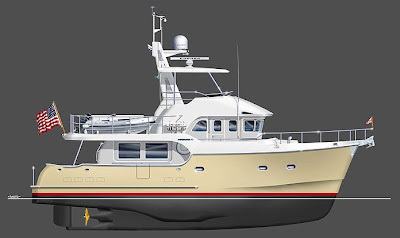 The new 57 Convertible will feature a robust hull with a beautiful sheer, a curvy, creamy smooth deckhouse with Viking’s new teardrop window lines and black mask windshield, a low profile wraparound flying bridge and 157 square-feet in the cockpit, including a spacious observation mezzanine. Ideally suited for tournament fishing, as well as long distance cruising, the new 57 Convertible will feature a three-stateroom, two-head layout for plenty of comfort and privacy thanks to the offset companionway, which utilizes space to its maximum efficiency. Equally inviting, the salon is plush and finely appointed with a 37-inch flat screen television and surround sound entertainment system. The starboard side galley merges practicality and fine living with Corian counter tops, abundant stowage, under counter Sub-Zero refrigeration, a microwave convection oven, and a three-burner electric cooktop. The 57 Convertible standard power is MAN V12 1360 CRM diesels. A higher performance package with twin V12 1550 CRM MANs also is available. 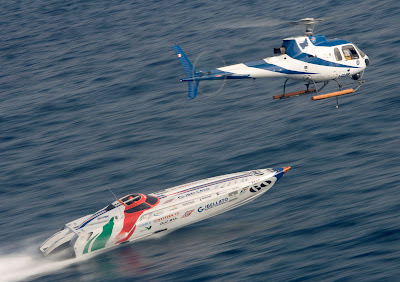 Powerboat P1 swaps Morocco for the majestic waters of Tunisia this year. Hosting the Tunisian Grand Prix of the Sea for the second time, Africa’s northernmost nation will provide a unique stop in the 2008 calendar, with the race weekend being held in the coastal resort of Hammamet. The 4th round in the North African continent will prove a vital stop before an official 2 month break for the season. The Tunisian Grand Prix is finally here and after a hectic start of the season for the boats, this was a much wanted longer 5 weeks break from the shore crew of all teams, so it will be interesting to see if any of the teams will have upped there game to be in more challenging form to the firsts of the class. Apart all the usual P1 action, Tunisia will also add the extreme heat which is expected to hit the North African Med race course with temperatures of 4o plus degrees Celsius. Time table has also been revised for a late afternoon, early evening race. In Evolution it will be curious to see if the dominating form shown by 88 Kiton Outerlimits in Malta, was a luck of many factors or if this is the boat to beat for the 2008 season. My gut tell me it's the later one, tough more friendly waters could prove a bonus to the smaller Evolution boats like the Fountain and the Skater V-399. SuperSport Class 44 Conam Yachts seem so far unstoppable, but teams like 38 Baia High Performance say that if weather conditions prove smoother they can be a match for the Italian Maltese pairing. The Tunisian Grand Prix will also mark the return of 11 Sunseeker Challenger in Supersport Class, after the accident in Marseilles in pre-race testing. Meanwhile 76 Italcraft Inrizzardi Evolution Class team will still be using the old Metamarine as in Malta, with the shore crew continue on updating and preparing the new alloy hulled Diesel Seatek powered Binautica, which should go for a record challenge to the Venezia Montecarlo race in the coming weeks, before racing in the next official round scheduled for Vigo in Spain. The renowned Australian builder Riviera, has adopted world-leading technologies to assist it's builders, engineers, cabinet-makers and electricians to develop a range of boats that are accepted and acclaimed worldwide. Now, every element of it's focus, experience, passion and achievements has come together in the Riviera 70 Enclosed Flybridge, the largest boat ever built by the company. This majestic new flagship of the proud Riviera fleet can only be described as the ultimate Riviera, a boat that will be enjoyed by a select few. The new Riviera 70 is the culmination of 27 years of dedication to the goal of building the best luxury boats in the world, equally at home in challenging seas as it is in a quiet cove or harbour. The brief was to develop a mid-range model with a definite point of difference from its competitors. Riviera also re-invents the meaning of flybridge stairs with the new starboard side internal staircase. The new flagship also includes a machinery room that deliberately separates tanks, engineering, mechanical systems and engines into distinctively separate areas of the boat, and re-defines luxury below decks. The Riviera 70 Flybridge is a superb long-range cruising boat and, unequivocally, the next step in the evolution of this concept of hull. Riviera, launched its new flagship 70 Enclosed Flybridge on the last weekend of June, preparing for its first sea trials on Queensland’s Gold Coast Broadwater. The giant boat, the largest production pleasure cruiser ever built in Australia, was trailered through the Riviera factory in Coomera before first light on Saturday and launched in front of Riviera’s new Aftermarket facility. Already Riviera has taken orders for five of the $4.75 million boats. With four cabins and four bathrooms, a massive saloon and flybridge, the Riviera 70 Enclosed Flybridge can comfortable sleep 10 people on an extended cruise. Mohammed Al Marri and Nadir bin Hendi produced the perfect performance to win a dramatic and incident filled Russian Grand Prix, held on Moscow’s Khimki Reservoir and in appalling conditions, maintaining the team’s perfect start to the season and defence of their World and European titles, making it three wins out of three for Victory 1. After a red flag and an aborted first start, Victory 1’s scratch-pairing and Championship leaders’ showed their superiority and dominated the race to lead from start-to-finish and win by over a minute, to give Mohammed Al Marri – replacing the injured Arif Al Zafeen - his 11th career win and Nadir bin Hendi his third win in a row. For Qatar 96’s Sheikh Hassan and Steve Curtis, second place was a result they desperately needed after the disappointment in Montenegro, but not the one they wanted, which now leaves them 29 points adrift of the leaders’ in fourth place. However, the outcome may well have been different if not for the coming together with Victory 7 after the restart, which left them trailing in fifth place at the end of the first lap. Qatar 95 made it a double podium-celebration for the team, their second consecutive third place to stay ahead of the their team-mates in the title race. For Victory 7, finishing in fourth place, there was frustration and anger, after a broken a propeller on lap seven robbed them and the team of a probable second consecutive one-two finish. Giampaolo Montavoci and Kolbjorn Selmer maintained their reliable form to secure more points by taking their third consecutive fifth place finish. This keeps them in fifth place overall in the Championship after finishing ahead of Jotun’s unlucky Jorn Tandberg and Inge Brigt Aarbakke, who, after starting from second place on the front row, broke a propeller on lap five when running strongly in third place, which ended any hopes of a podium finish.